There are tasting experiences that collectively push the bar to a completely different level. On this particular monsoon evening in Mumbai with Malt Maniac’s Krishna Nakula, none were standard distillery drams. All but one would qualify as ‘adult‘ whiskies, representative of an older style… From Gordon & MacPhail‘s rare old collection of closed distilleries to Signatory Vintage‘s mature cask strength set to a unique Master of Malt single cask series, these were no ordinary single malts. These were the drams that dreams are made of… prompting a few of us wonder… are we truly worthy? You will simply need to be patient over the coming weeks as I catch up with all the marvellous malts enjoyed. Trust me… it will be worth the wait. And a HUUUUGE thank you to our host, whisky contributors who made such an exceptional evening possible! You know who you are. 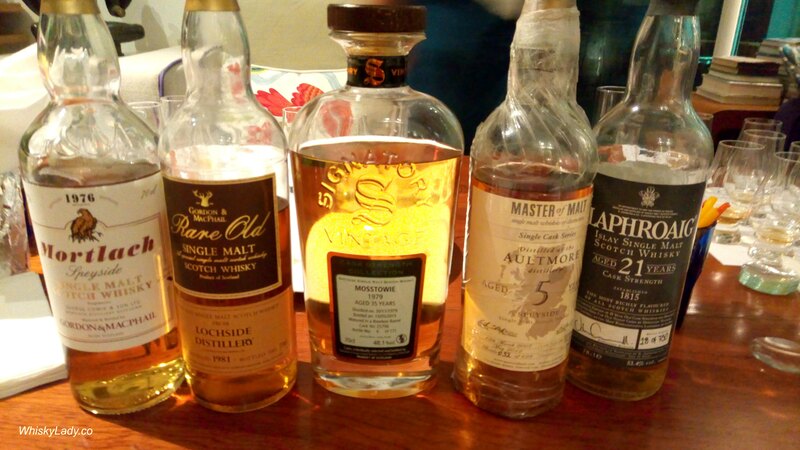 This entry was posted in Highland, Islay, Scotland, Speyside and tagged Aultmore 5 year, Discontinued distillery, Gordon & MacPhail, Krishna Nakula, Laphroaig T5 21 year, Lochside 1981, Malt Maniac, Master of Malt, Mature malts, Mortlach 37 year, Mosstowie, Mosstowie 36 year, Rare Malts, Signatory Cask Strength Collection by Carissa Hickling. Bookmark the permalink.